Ugh! Get me outta here! 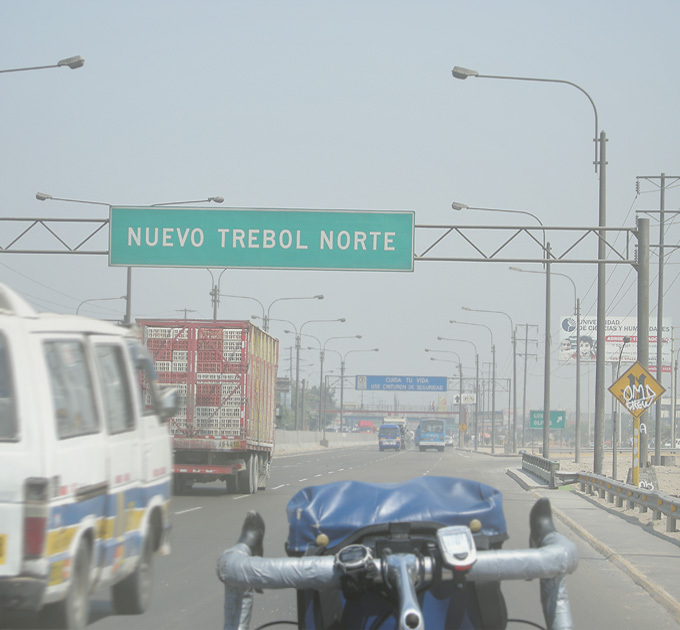 The Pan-American Highway north of Lima. Travelling by bicycle is the most enjoyable way to see a country. Except when it’s not. If you tour long enough, eventually, you’ll have a bad day. 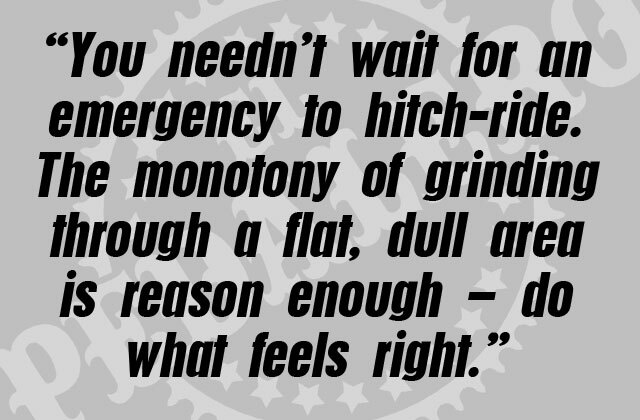 Whether it’s torrential rain, intense heat, bad drivers, swarming insects, broken gear, illness, injury, fatigue, or just plain boredom, the time will come when you’ll want to stop riding and start hitch-riding. Hitch hiking + riding = hitch-riding. 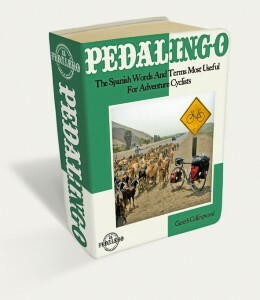 For years, I thought I invented this term until I heard another cyclist using it (only logical, I suppose; I mean, what else would you call it?). Hitch-riding, by my definition, means you ride a section, then hitch a section, then ride again, hitch again, and so on (perhaps several times in one day) in order to get through an undesirable area quickly. Obviously, the point of bike touring is not to travel quickly but to slow down and appreciate your surroundings. The problem is, not every area is worth appreciating. True, there’s something to learn from riding the “rougher” sides of Latin America. But after a week on the same stinking, garbage-strewn, billboard-lined highway, what are you learning? I’ve tried hitch-riding in every country in Latin America. Partly, I did this to research the subject, but I’ve also hitch-ridden out of genuine need on several occasions: a broken bike frame in Patagonia; severe leg cramps in Bolivia; running out of water in the Atacama Desert. From what I’ve seen, hitch-riding is about the same in every country except Cuba; the hardest place to get a lift. Some countries (Costa Rica, for example) have laws against people riding in the backs of trucks, but these laws seem to go unenforced. All my hitch-riding experiences have been positive. Some even led to free meals, home stays, and life-long friendships. But it’s an unpredictable activity in an unpredictable region so there are several considerations. • When the road is unsafe: When blind corners and potholes combine with fast, heavy traffic on a road with no shoulder, you’re better off riding on the back of a truck than ending up underneath one. • When you’re about to enter a busy tunnel: It’s hard to tell whether a tunnel is dangerous beforehand, but if you’re in any doubt, don’t risk it – hitch-ride it. • When you’re exhausted, sick, or injured: You may be tough enough to ride through sunstroke, exhaustion, injury, and illness, but you can seriously harm yourself doing so. Best to hitch-ride to the next town. See a doctor if you have to. • When your bike is broken beyond repair: Don’t waste time getting frustrated. Hitch-ride to the nearest taller or bicicletería and get it fixed. • When you’re out of food and water: If you’re stuck in the middle of nowhere with nothing to eat or drink, don’t wait until you’re hungry or thirsty to do something about it. • When the weather is bad: Anyone can ride through an afternoon’s drizzle, but when torrential rains turn roads into rivers cycling is, at the very least, extremely unpleasant. It can also be deadly. • When you’re running out of time, money, or both: When your flight home is in three days, and the airport is still a thousand kilometres away, it’s time to look into your hitch-riding options, pronto! • When you feel like it: You needn’t wait for an emergency to hitch-ride. The monotony of grinding through a flat, dull area is reason enough. I’ve met cyclists travelling entire countries by hitch-ride, biking the good parts and hitching the rest. It’s your adventure and there are no rules – do what feels right. Where Can You Find A Hitch? • Gas/service stations: These are the best places to hitch. They’ve got plenty of space to load a bike and they appear at regular intervals. Many have food, toilets, air-conditioning, and helpful staff. I’ve even had friendly pump attendants talk to drivers for me, insisting I relax in the air-conditioned convenience store while they find me a ride. Nice! 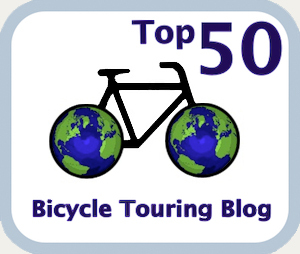 • Roadside restaurants: Most have a parking area off the road perfect for loading a bicycle. You can either thumb a ride just before the pull-off, or sit down for a coffee and approach drivers as they come in to eat (offer to pay for lunch). 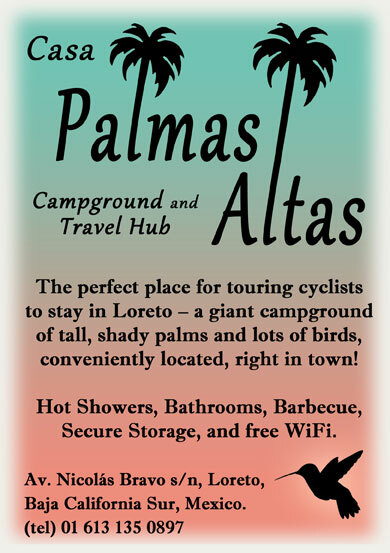 • Pull-off (rest) areas: When you’re on a road with no service stations or restaurants, find a pull-off area of flat ground or a wide shoulder and stand with your bike about twenty metres in front of it. Stick your arm out, and smile earnestly, but don’t overdo it. You want to appear friendly and serious, not insane. Where Is It Hard To Hitch? • Busy roads with no shoulder: Be extra careful on winding roads with blind corners. If it’s an emergency, go to where the road bends inwards between two curves and wait for a significant pause in traffic before sticking out your thumb. Load your bike quickly and keep an eye out for traffic. • In the middle of towns and suburbs: Get away from local traffic. Get to edge of town and find a service station. Approach drivers while they’re filling up for a long drive out of town. Offer to chip in for gas. What Kind of Vehicle Should You Look For? • Pickup trucks: Most pickups can fit two loaded bikes plus their owners – although you’ll often be invited to sit up front. In small pickups, the gate may have to be down for the bike(s) to fit. Tie everything down with your bungee cords, sit with your back against the cab, and hold on to the frame(s). I’ve done this many times and always felt safe doing so. • Farm trucks: Big, rusty farm trucks with high wooden sides are common in rural areas and they make good hitch-riding vehicles. They’re noisy, dirty, slow on the hills, and often come with a group of friendly peones (farm workers) in the back. • Large vans: These are good when it is raining. • Big rigs with trailers: These are good if you need to cover long distances. Plus, the drivers are full of interesting information not found in any guidebook. 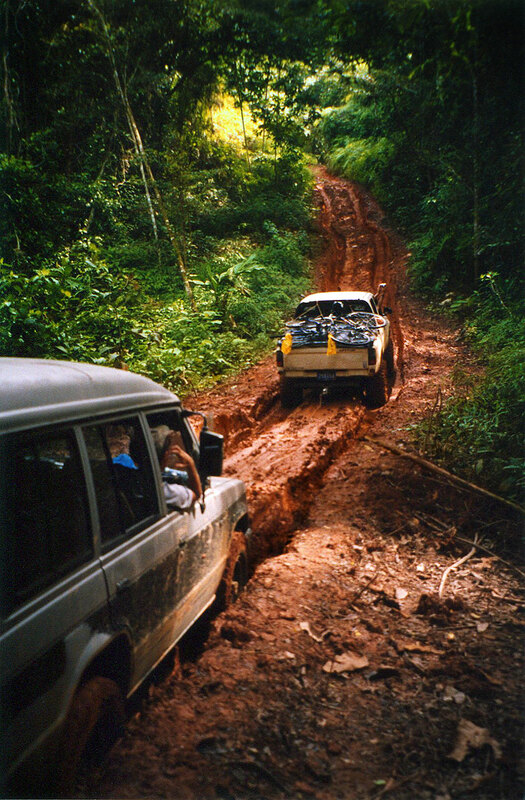 • Flat-bed trucks with open sides: Dodgy, but not impossible. Make sure your bike and bags are secured with bungee cords before pulling away. If you’ll be riding in the back, sit as far away from the edge and close to the cab as possible; and hang on to something. • Cars: Sometimes, the only option is a car. Admittedly, loading a touring bike into a small hatchback can be a pain, but if the driver doesn’t mind, there’s no reason you should. More on the finer points of hitch-riding protocol in: Hitch-Riding–Part Two: Etiquette. 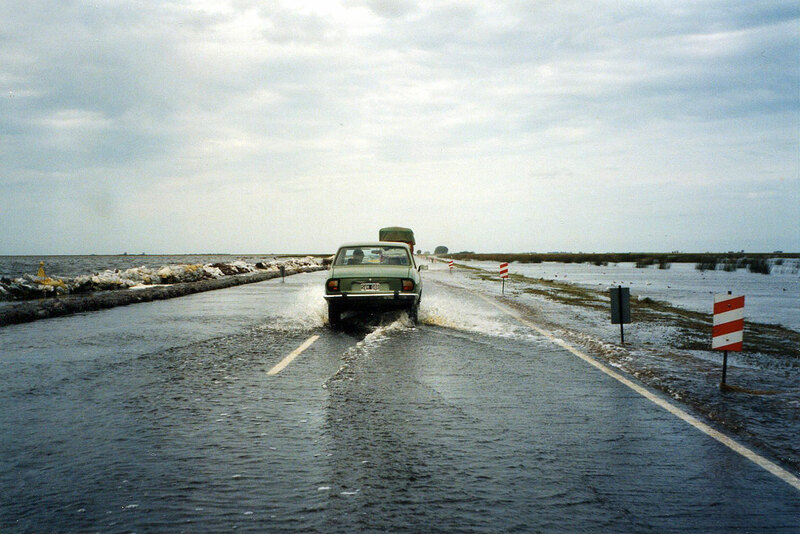 Serious flooding on the ride to Buenos Aires along Ruta 7 in the late nineties. This photo was taken from the dry, comfortable passenger seat of the car I was hitch-riding in. 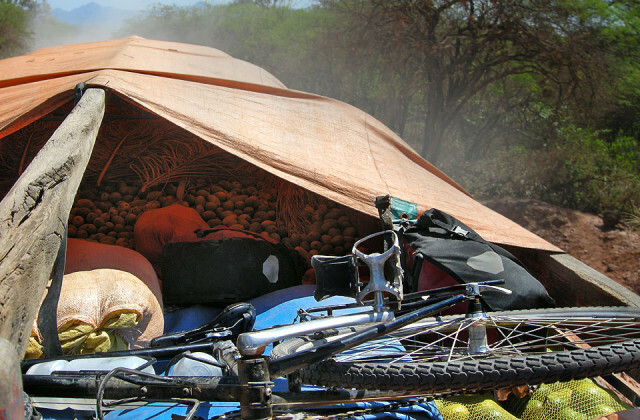 Feature image (top of page): Hitch-riding in Bolivia in the back of a big mango truck after a mysterious illness left me with debilitating leg cramps. In Argentina riding on the back of pick ups is illegal. One of my drivers got fined for it. However it is quite usual and did it during most of my hitchhiking trip heading from Buenos Aires to the Bolivian border. Good luck with your future hitch rides!